This ride starts out by following Tafoni Trail. 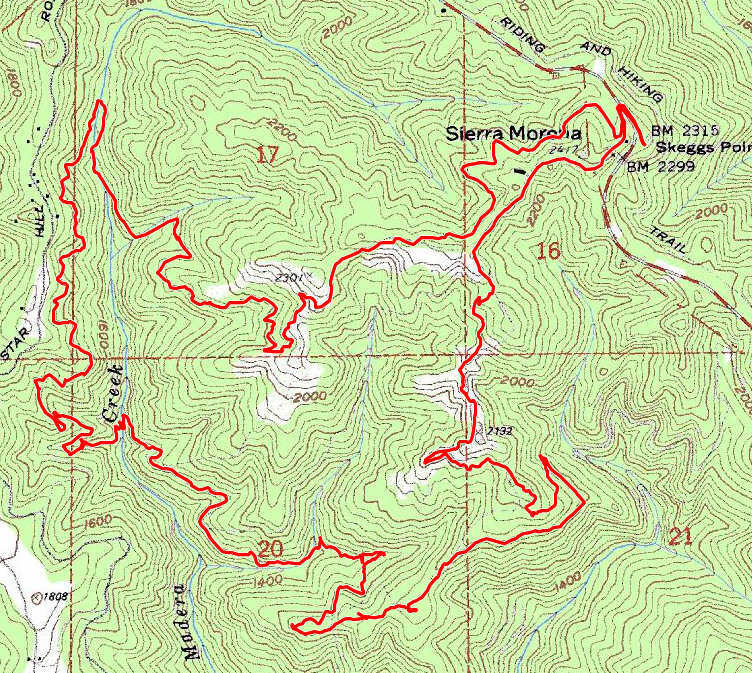 This one is a curvy fire road that undulates a little bit but does not experience any drastic change in elevation. Then you get on Fir Trail, which is a similar one (as far as the portion of that trail included in this particular ride is concerned; otherwise, it gets very different and steep later on). Along Fir Trail there's a small clearing where you'll find a memorial plaque in memory of the people who lost their lives in the crash of the aircraft Resolution in this park. The actual spot of the crash is along Resolution Trail; hence the name. You'll also notice a short connector trail departing from this clearing. This leads to a small vista point where some limited views are available to neighboring ridges toward the southwest, as well as down to sections of Resolution Trail. Fir Trail starts a significant descent after this point and things start to get more fun, though it's still a fire road. One of the best parts of this ride starts when you turn onto Resolution Trail. This is a twisty, narrow, and technical singletrack descending gently along a steep hillside. You may also notice the few bits and pieces of remaining debris from that plane crash spread over a couple of dozen yards downhill from the trail at one spot somewhere near the halfway point of this trail. At the next junction, Resolution Trail ends and you continue downhill on El Corte de Madera Creek Trail. This portion of the descent, while originally a fire road, feels more like a singletrack today due to a prominently established line, so it's fairly fun. El Corte de Madera Creek Trail begins a climb quite suddenly, shortly before it crosses its namesake creek. This is interrupted by a brief descent toward the crossing itself, but it resumes and is sustained after that. The trail climbs for only about a quarter mile before you reach North Leaf Trail, but you gain 150 feet in that distance, meaning the grade usually ranges between 12 and 16 percent. North Leaf Trail is another great technical singletrack and, although it has you pedaling uphill for a few hundred feet near its beginning, the slope of that climb rarely exceeds 10% and you quickly resume a gentle descent after a brief stretch that's level. The descent becomes more steady when you turn onto Methuselah Trail. For three quarters of a mile, Methuselah descends with an end-to-end average grade of -10.5% on its way to another crossing of El Corte de Madera Creek, this one at the spot with the lowest elevation on this ride route. Your payback for the long overall descent from the beginning of the ride up to this point begins when Methuselah Trail begins to climb after its creek crossing. The earliest part of Methuselah's climb out of the creek bed is its toughest. Over the first 500 feet or so that you cover on this stretch, the end-to-end average slope is 17%, naturally meaning that the figure exceeds 20% plenty of times over that stretch. The trail then relents and soon transitions from a shady singletrack to a fire road at a spot when you emerge onto a small, sunny clearing. You don't follow the fire-road incarnation of Methuselah Trail for more than a quarter mile on this ride, and that stretch of the trail is more or less level. Then you turn onto Giant Salamander Trail, which starts off to the right from Methuselah. This is one of the crown-jewel singletrack trails of the park. This narrow trail starts out with a short, sweet, and playful descent. You then start pedaling gently uphill, but the trail's elevation gain doesn't begin in earnest before it crosses another branch of El Corte de Madera Creek. This tough climb starts out steeply and the slope very gradually slackens. Initially it routinely exceeds 20% grade, but later stays below 15% grade more consistently. Toward its upper end, it settles into a playful section of tight twists around the trees in an almost-flat, wooded section. Most people would actually say that its preferable to ride Giant Salamander in the other (downhill) direction. I would agree. But, for the purposes of this particular route, this is the only way of chaining this pretty trail into this loop. You can try it in the downhill direction on another ride. At the end of Giant Salamander, you'll find yourself emerging onto the fire road that is Timberview Trail. This trail will serve as your conveyor to Manzanita Trail. Your initial bout of climbing on Timberview is roughly a half-mile stretch where you'll gain a little over 150 vertical feet. It's not exactly a piece of cake and the climb is not very uniform. So, super-steep spots are intermixed with brief breathers. You also pass by an old-growth redwood tree on this stretch of the ride, which you can visit right off the trail but can't directly see from Timberview Trail itself. You'll notice that a short spur of this ride route does just that. Your climb on Timberview Trail is interrupted when you turn onto Crosscut Trail. This serves as a welcome break from the climb. Crosscut stretches for about half a mile without much elevation change, cutting across a steep hillside, and would almost qualify as singletrack. At the other end of Crosscut Trail, you connect to Timberview Trail again, to resume your climb toward Manzanita, but this time approaching it from the opposite direction. This stretch is barely a quarter mile in length, but it's hard to ignore, because its average slope is nearly 13%. Since it's also a bit "lumpy" (like the other portion of Timberview), there are numerous spots here where you'll find yourself at or near 20% grade. That torturous climb ends not immediately when you turn onto Manzanita but shortly thereafter. Manzanita Trail is another one of the prime singletrack trails of this park. Traversing it in this direction, you'll be doing it uphill. I'm sure most people would say that the "correct" way of riding Manzanita is downhill. I'm of two minds about this. While I agree that riding it downhill is buckets of fun, I also enjoy immensely to climb it. It's one of those climbs that I like because (while being very technical) it's steep enough to be challenging for me without being too steep to handle. Be aware that North Leaf Trail, the lower portion of Methuselah (traversed on this ride), and Giant Salamander Trail are subject to seasonal closures. Make sure you check the park's website (whose link is available on your left) for the trail conditions before you plan your ride.